installation with 10 minute looping videos and a soundtrack created of found-soundand original music. I smash a single white alarm clock (stopping the measurement of time to overcome it's constraints). 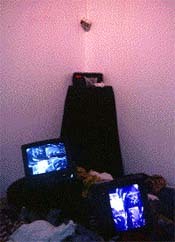 The video loops continuously during the installation. Stills of the video are also avaialble.